Dim sum, basically Chinese brunch tapas, is something I learned about on TV, as neither Watertown nor Binghamton, to my knowledge, have any such restaurants. If I’m incorrect in this assumption, I implore you to direct me to the nearest Dimporium post haste, because even before I’d ever tasted these morsels os Asian artistry, I knew I’d love them. Like, back with Will and Grace were kvetching about going for dim sum, I wanted in. As usual, Jill led me to the promised land without even knowing I wanted to go. That is why we will be bosom friends, always. 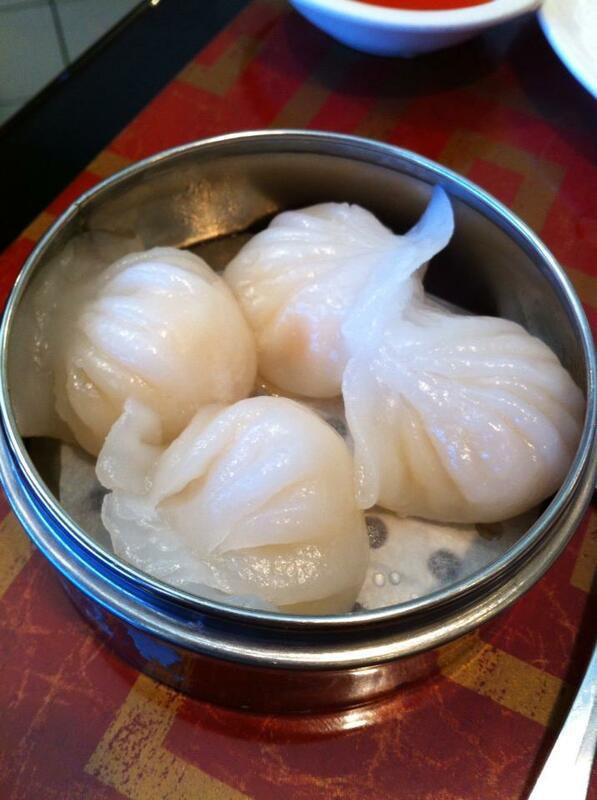 As we were doing some last-minute Sunday shopping in Southern Jerz when I visited her earlier this month, Jill casually suggested dim sum for brunch. I think the boisterous volume of my “Yes!” surprised her a bit. She drove us to Joe’s Peking Duck House, in Marlton, without delay. When we visited, the first thing to note is that we were the only non-Asian table in the place. A very good sign. Of course, I can’t tell you if they all were Chinese, or some other nationality, but when you’re eating ethnic food, it’s always a glowing endorsement when people of that ethnicity are eating there, too. 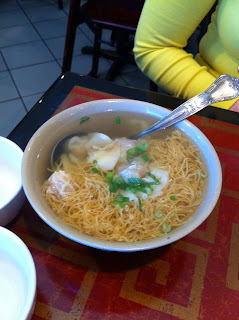 Because I was still recovering from a pretty wicked cold, we started the meal with wonton noodle soup. This is basically clear chicken soup, no meat, but packed with handmade, thin, chewy noodles, and the best damn wonton dumplings I have ever had. I like the wonton from the local Chinese place in Endicott I frequent, but I’m sorry, those thick-skinned, bland blobs have nothing on these delicate bundles of flavor. This is the soup I will forever long for when down with the sickness. It’s a pity it lives in New Jersey and not next door! Those thin noodles were actually cooked al dente, and had the rough exterior texture you know comes from handmade, hand-pulled pasta. Each fragile dumpling was extraordinarily well seasoned, with scallion, and perfectly balanced notes of white pepper and sesame oil. I didn’t have to add a drop of soy to the two bowls of Heaven I slurped down. Next up: Peking duck rolls, a delicacy! These are sliced BBQ duck breast and scallions wrapped in a flour tortilla-like wrapper, and served with hoisin sauce, which is China’s answer to BBQ. I felt like the duck could have been more tender in these, but loved the sweet, rich flavor, cut by the tart scallions. These were simple, fresh, delicious. Then, one of the best things I have ever eaten in a Chinese restaurant hit our table: fried shrimp balls. These things are stupid good, y’all. The flavor was like very clean, super fresh, briney shrimp paste, covered in a very neutral batter and unsweetened rice krispies, then deep fried. The shrimp was, again, incredibly seasoned, salty and rich in a way I’ve never tasted before. The mix of crispy fried rice and salty, deep seafood was a heady, delightful mix. They were absolutely, fabulously, terrifically, scrumptious, and I would like a plate of them delivered to me on the regular. The hargow came next, which we ordered without really knowing what they would be. Surprise surprise, more of that insane shrimp paste, wrapped in fantastically delicate dumpling dough and steamed. These were a very traditional dim sum dish in appearance, and while less ridiculously good than the fried balls, still wonderful. I feel like an interesting dipping sauce, maybe with some heat to it, would have complemented these well. 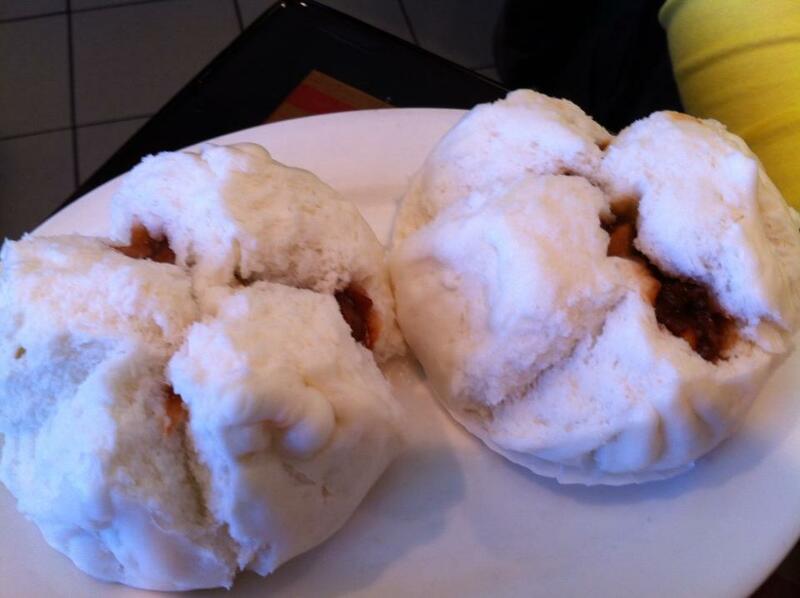 The first dish I picked, and maybe the most different from what I expected, was the BBQ pork buns. I was expecting the BBQ pork to arrive wrapped in smooth, bland bao buns, but these buns were crafted of a rough hewn, tender, snowy white, homemade dough, a bit pasty, and intentionally bland so that the pork can steal the show. Unfortunately, for me, the amount of pork was too little to stand up against that expanse of dough, and the pork was tougher than I would have liked. There was good sweetness to the sauce, but overall, not enough complexity to make this the dish I was hoping for. This is going to be the place I beg Jill to take me every time I visit her – we were discussing that even as we were tearing in to each plate brought out to us. 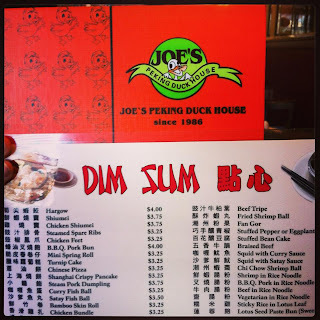 There are so many things off the Joe’s Peking Duck menu I need to try: honey glazed roast pork, Cantonese roast duck, honey glazed walnut shrimp, Cantonese chicken hot pot, string beans with minced pork, and soy sauce pan fried noodles! And Jill has told me that they serve the precious soup dumplings here. I hope what she thinks are soup dumplings are the same as what I think they are, because if so, I cannot wait to try these bundles of scalding hot, densely flavored broth inside gorgeous pasta dough! If you’re in Marlton for business, shopping, or visiting friends or family, put Joe’s on your list. It ain’t fancy, and it isn’t fine dining, but the service was great, and the food was groaningly, ragingly good. Get some! My hunger is big; my personality is bigger! I firmly believe wonton soup cures all ills. Love the post title. 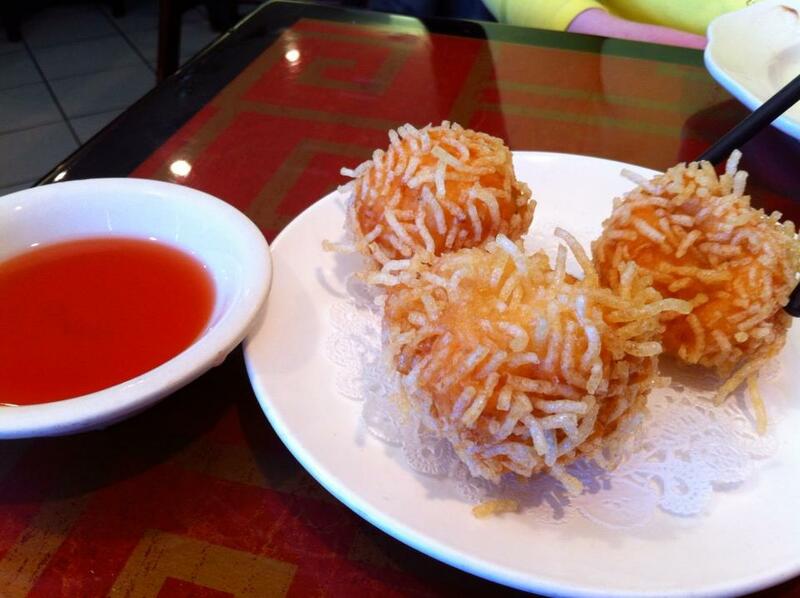 Those shrimp balls? Yes, please.